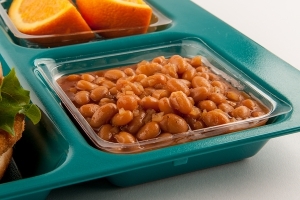 Pour canned beans into 12" x 20" x 4" steamtable pans. For 100 servings, use 2 half-size steamtable pans. Combine onions, dry mustard, brown sugar, water, tomato paste, and ham. Blend well. Stir to combine and cover pans.